(DFC) movement enabling children and youth to take action on issues affecting them in +65 countries. ​DFC began in 2010 by Kiran Bir Sethi at the Riverside School in India. Endorsed by the Harvard School of Education, its Design Thinking methodology has afforded it a 2012 Index award and an Ashoka/Lego Reimagine Learning award in 2014. eduSOIL is the official licence holder for South Africa and takes Changemaker programmes to learners, youth and educators, empowering them to tackle issues that bother them in their schools and local communities. - frequent, ongoing case-by case support. A full day boot-camp for educators, learners, corporate volunteers and youth volunteers. ​Participants receive toolkits, lesson plans, learner workbooks. Stationery and resources are provided for use at the lab. Available by pre-booking only. 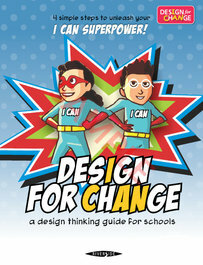 The Design Thinking Guide for Schools is designed as an individual workbook for 13-year-olds (Grade 8). This 30-hour curriculum allows for flexibility in implementation as per each school's own philosophy and context. Be inspired by 24 stories of change from children around the world. Lend your ears to their stories of care and determination. Celebrate the tales of the real super heroes. When learners submit their story of change, they stand a chance to be chosen as a student ambassador to represent their country at the annual Be The Change Conference, organised by DFC. They also stand a chance of their story of change being showcased in videos and the yearly I CAN publications - a collection of stories from around the world-stories of children leading change. Organized annually, the Be The Change (BTC) Celebrations provides our young super heroes from across the world the platform to showcase their stories of change. The celebrations honours and recognizes the young agents of change for their courage and determination to change the world around them. The celebrations bring together young change agents across the world, giving them the opportunity to not just share their stories but at the same time learn from each other. The atmosphere at the celebrations is one that generates positivity, inspires & motivates every participant, celebrates and honours our young student leaders. Thus, creating a sense of possibility of the changes that our children can bring about in the world.